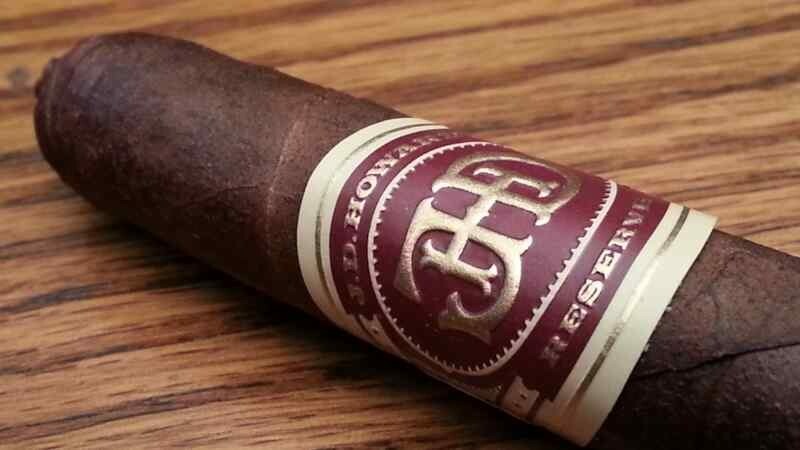 One of several 2015 LE’s from Crowned Heads, the Single Action was an addition to the JD Howard Reserve line. Only about 2,000 boxes of 10 cigars were produced, and the cigar carries an MSRP of $9.25 per cigar (and they’re still out there if you’re interested). It is a 6×38 petit lancero, featuring a Brazilian Arapiraca wrapper over Ecuador Sumatran binder and Nicaraguan fillers. The line is produced by EP Carrillo in the Dominican Republic. Carrying with the JD Howard theme, the cigar is named after Jesse James’ weapon of choice – the Colt Single Action. I got some info on a new line from Luis Sanchez this week, called the Figurado Series. It will initially be available in a single 5”x54 “Chulo” vitola, and two different wrappers -Ecuadoran (natural) and San Andres (maduro). Filler leaf will include some of the tobacco grown by Luis and Terry Johnson at their DOMUSA farming operation in Villa Gonzalez, DR. I did not get pricing information, but it should be stateside in the next couple of weeks. AJ Fernandez is extending the New World line to include a Connecticut wrapped version. The New World Connecticut will feature an American-grown CT shade wrapper, Mexican San Andres binder, and a filler mix of Nicaraguan and Brazilian leaf – which is very different from the standard New World (“Dark Nicaragua” wrapper over Jalapa binder and a filler blend of Viso Ometepe, Condega ligero, and Estelí-Finca Soledad ligero, and “Dark Nicaragua” wrapper). It will be available in four vitolas – Corona Gorda (5.5×46), Robusto (5×50), Toro (6×52), and Belicoso (6×54). Pricing will be in line with the existing New World lineup. A few weeks ago, we talked a bit about La Flor Dominicana’s novel idea for having TAA members vote on this year’s TAA LE with their pocketbooks. The gathering is over, orders placed and a winner selected. The winning cigar is the 5.5” x 52 robusto. The line features an Ecuadoran habano wrapper, Mexican binder, and Dominican fillers. MSRP is about $9 per stick, and it should arrive on retailers’ shelves in about a month – assuming you have a TAA member retailer in your neck of the woods. Following the lead of several municipalities around the state, Florida’s capital Tallahassee is looking to make it harder on employees who smoke. An intent has been announced to end the hiring of any tobacco users, and prohibiting tobacco/e-cig use in all govt owned buildings, vehicles, etc. – even during break times. Hiring changes would go into effect July 1, 2015, while other aspects would be phased in over the next two years (including a $20 fee [and it’s not an increased insurance premium….it’s a fee]from employees’ paychecks if they smoke). A follow up to a program we previously discussed called Cigar Sense. Back in November we (Craig) had some choice words for a few of the statistics they shared from a survey of 400+ cigar smokers they recently spoke with. We saw some irregularities and downright confusing data being thrown about and rightfully scratched our head when trying to make heads or tails out of it. That same organization has just today discussed that they are using a “control” group of over 1,200 cigar reviews to provide a database to help smokers pinpoint sticks that will line up with their palate. The rub here is that the program determines what will fit your tastes based upon what else you like. Check out cigarsense.com for some cool introductions into the program and to formulate some of your own opinions. This is where we chat about our week in smoke…tune in to the show for full details about our experience with these (and more). TL Johnson Legend Reserve 63 Maduro – I second what I said a couple shows back. Genius exemplified in a cigar. LEAF by Oscar Connecticut. I got this from Franky99 when he was down from the GWN visiting Tampa. Next episode (112) we will be featuring the Southern Draw KUDZU, with special guest owner Robert Holt. So come by Half Ashed Friday night at 9:30pm EST and hang out with us in the chatroom during the show. If you would like to contact us in the meantime, you can reach us via the Contact Page or the following emails: [email protected] or [email protected] Please feel free to drop us a line if you have any questions you’d like answered, comments to make…or even compliments and complaints. We love to get your emails! Also, remember you can always go back and listen to previous episodes, which can be found in the Half Ashed Archive. You can download this week’s audio directly below (right-click “Download” and save), find us on iTunes, or subscribe with any podcast app at our RSS Feed. Video, as always, will be available at the Half Ashed YouTube Channel. P.S. – If you have unbanded suggestions or contributions, you can get those to us by sending an email to [email protected] This email address goes directly to my wife, so you can simply suggest an unbanded cigar for her to source, or send me an [email protected] if you have something you’d like to send in. I will provide an address to send them. Thanks! (Miami, Florida) April 22, 2015— Earlier today, A.J. 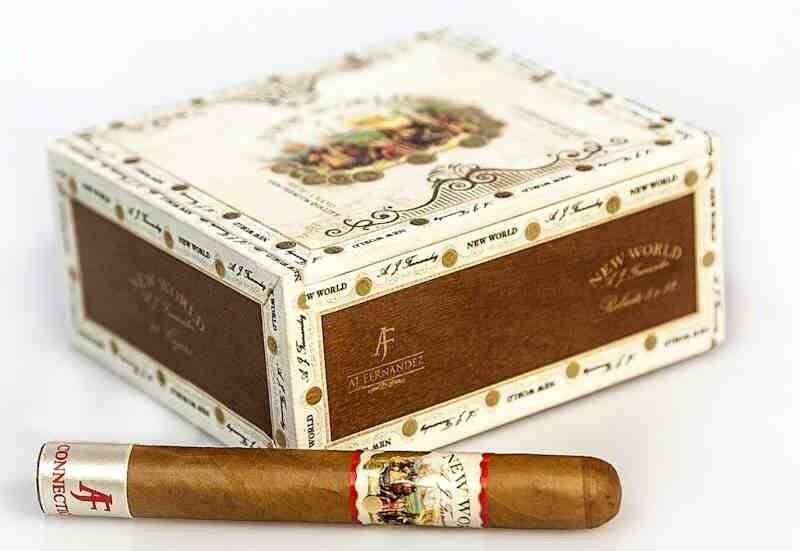 Fernandez Cigars announced the imminent release of the New World Connecticut. The unique blend was created after a positive response from both public and critics since unveiling the existing New World line at the 2014 IPCPR tradeshow. The original line received honors as the Number 1 Cigar in the World 2014 from Cigar Journal Magazine. The New World Connecticut will begin shipping in May. A.J. Fernandez Cigars is based on the rich tradition of the Fernandez cigar legacy. A.J. Fernandez produces unparalleled, hand-rolled cigars in Estelí, Nicaragua, which have garnered numerous top ratings and acclaim from cigar publications and consumers alike. Today he continues the family legacy as he oversees production and manages the day to day operations in his factory in Estelí. For media inquiries please contact Creativas Group Public Relations via: [email protected]. 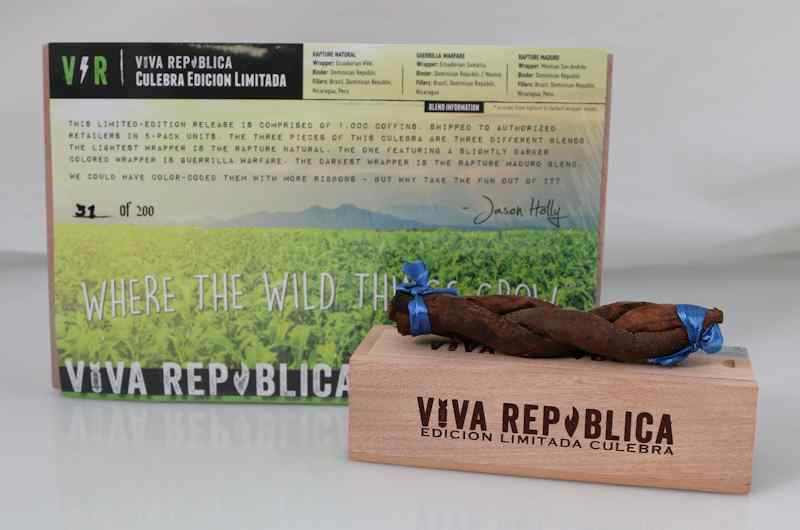 Yesterday, Viva Republica™ announced the impending release of a Limited Edition Culebra. Only one thousand (1,000) coffins each containing a traditional three-piece culebra have been produced, shipping in retailer 5-packs (5 coffins per pack). The Culebra is comprised of three differing blends, featuring the Company’s Rapture, Rapture Maduro and Guerrilla Warfare brands. “I’ve always been intrigued by and have enjoyed culebras and wanted to use creating one as an opportunity to feature three of our core lines,” said Jason Holly, owner of Viva Republica. The cigar(s) will officially launch during the DC Tweet Up on Saturday, March 14 at Tobaccology in Manassas, VA from 1:00 pm to 3:00 pm. The limited run has an MSRP of $18 (excluding applicable local tax). Viva Republica is exclusively distributed in the United States by Miami Cigar & Co.
June 24, 2014 – Earlier today, Gary Griffith of Emilio Cigars announced that the limited edition Emilio Cigars Draig Cayuquero lanceros will begin shipping on June 25, in honor of his 60th birthday. 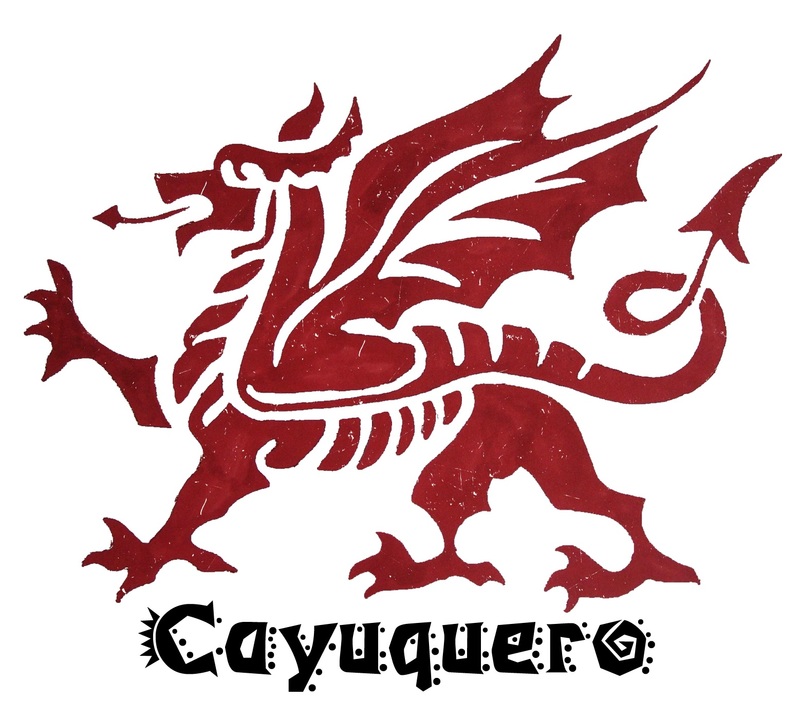 The Cayuquero line is produced for Emilio by Noel Rojas’ Guayacan Cigars in Nicaragua, and features a Brazilian Arapiraca wrapper, and Nicaraguan filler comprised of leaf from both Jalapa and Esteli. The original lineup was limited to four vitolas (Robusto (5×50), Toro (6×50), Torpedo (6×50), and Corona (5.5×42)), and only 1600 boxes, and the new lancero will be limited to 100 boxes of 10 (total production 1,000 cigars). According to Griffith this will be the only time the Cayuquero is produced in the lancero size. The Draig series of cigars honors Griffith’s Welsh heritage, and each Draig blend is entirely different. The previous Draig release, the Draig “K” was featured in a Cigar Spotlight here on The Cigarmy back in October, 2012. General Cigar announces the world premiere of 1907 by Dunhill®, a medium-bodied, four-cigar collection that will be available at fine cigar shops nationwide, and at premium tobacconists worldwide, beginning in May. 1907 by Dunhill marks the first full-time new Dunhill brand since its Signed Range was introduced in 2001, and commemorates the first box-pressed cigar in the entire Dunhill portfolio, with the range’s new Toro size. Miami, FL, March 24, 2014: Drew Estate announced today their plans to release a new size within their Undercrown cigar line. The size will be called Undercrown “Dogma”, and has been created to celebrate the one-year anniversary of the online community Cigar Dojo. 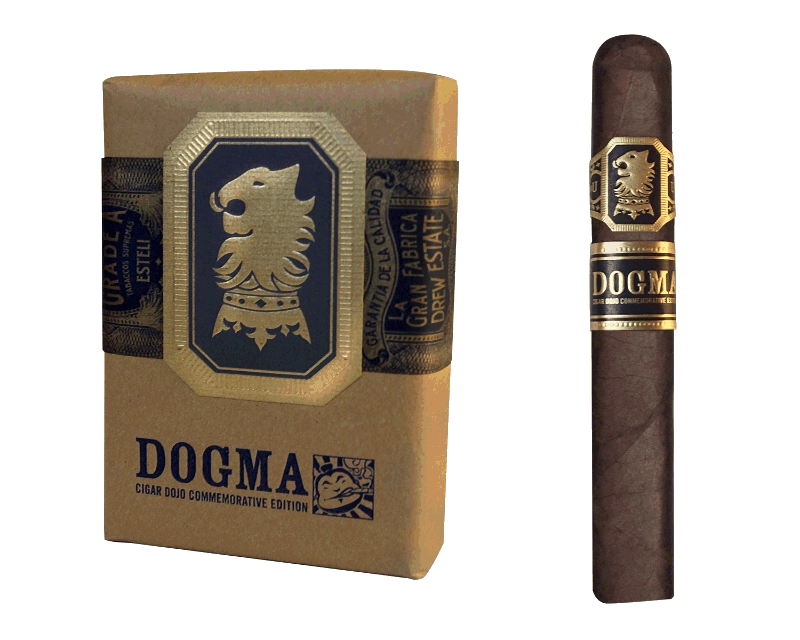 The blend of “Dogma” is based on the Undercrown Corona ¡Viva! and is comprised of Mexican San Andres wrapper, Connecticut Stalk-Cut Habano binder, and Nicaraguan & Brazilian Mata Fina fillers. The “Dogma” will come in a 6 x 56 box-pressed vitola. 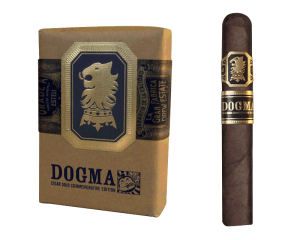 The Undercrown “Dogma” will be available for pre-order Friday, March 28th, 2014, through SmokeInn.com. In the meantime, make sure to enter Drew Estate’s “5 Days of ‘Dogma’” giveaway for your chance to try the cigar before anyone else in the country. If you have any questions, please contact Drew Estate’s Public & Media Relations representative, Johnny Brooke. 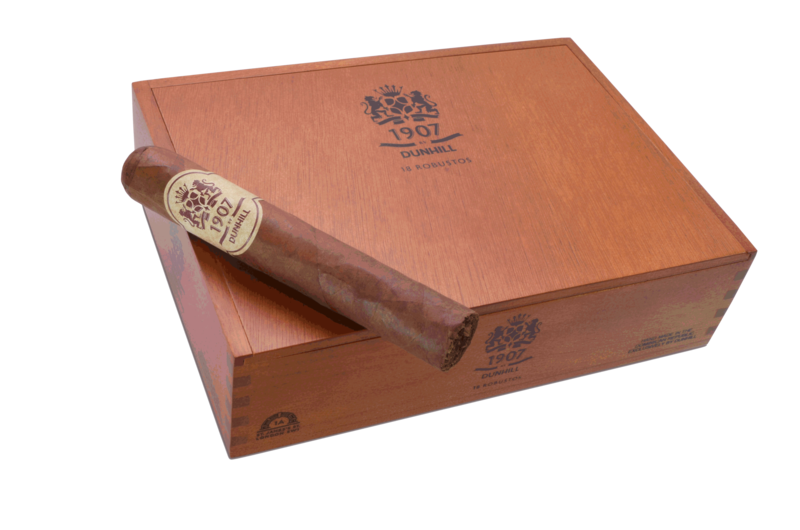 FOR IMMEDIATE RELEASE: Ezra Zion Cigar Company, makers of #1 Cigar of the Year 2013 Tantrum and the #1 Cigar of the year 2012 Jamais Vu, announces it’s newest cigar release FHK. “We know it’s symbolic and somewhat tongue-in-cheek but we wanted to ring in the New Year by launching this project that’s been in the works for so long. 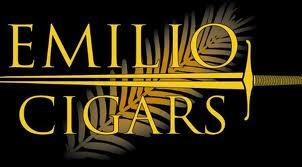 It’ll be the first cigar in the world released in 2014.” noted co-owner Chris Kelly. The FHK will be available in 4 vitolas: a 5.5×50 “Inspired” robusto, a 44×7 “Truth” lancero gordo, a 54×7 “Stature” corona gorda, and a 52×6 “Character” belicoso. “We had two goals with the FHK. We wanted to use unique tobaccos from several different countries and we wanted to leverage our buying position to offer a lower price-point than our other lines.” added Chris Kelly. FHK retails for $9.00 for the robusto and lancero sizes and $10.00 for the corona gorda and belicoso. Tobaccos used in the blend include a San Andres wrapper, Indonesian, Brazilian, and Nicaraguan binder and filler. Gary Griffith announced today that House of Emilio, which includes the Emilio, 1502, Ezra Zion, Nomad, Epicurean, Rodrigo, Guayacan, and Bodega Premium cigar brands has created a “Master Retailer” program. Participating retailers receive training for their staff on all House of Emilio brands and blends so as to best serve the consumer. Qualifying retailers carry facings from every brand in the line, assuring consumers the best possible selection from a well-informed and educated staff. In addition consumers can be assured that Master Retailers have the earliest access to new product releases, and enjoy the benefit of extra allocation of limited edition products. Over time this program will be expanded to include additional enhancements that will have value for both the retailer and consumer. Interested retailers may get additional details by contacting Nathan McIntyre, National Sales Director. Secondly, I received further news on the upcoming Draig Cayuquero release, which was announced earlier this year…..
Gary Griffith of Emilio Cigars announced today that the second release in the Draig series, Cayuquero, will begin shipping to retailers within the next few weeks. Each year Griffith creates a new blend in the series, and production is limited to however many cigars can be made from the selected tobaccos. This years release will be available in four sizes: Corona, Robusto, Toro, and a small run of Torpedo. Total production is 1600 boxes, with quantities per size varying based on how wrapper graded out. The cigars feature a Brazilian Arapiraca wrapper, enveloping a delicious blend of sweet Jalapa, and spicy Esteli ligero, and are packed 10 to a box. 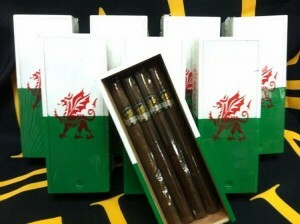 As always, the cigars are dedicated to Griffith’s Welsh heritage, and feature the Welsh dragon on both the boxes and bands. 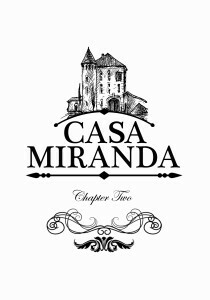 Miami, FL June 6th, 2013 – Everybody loves a good sequel, and the Casa Miranda Chapter 2 is set to debut at IPCPR which is being held this year in Las Vegas, NV. The follow up to the original which was made in Miami at the famed El Titan de Bronze, will be made at My Father Cigars S.A in Esteli, Nicaragua. The tobacco used for this new chapter is a dark Nicaraguan Corojo wrapper with filler from Brazil, Dominican Republic and Nicaragua. We are pleased to announce that we have completed the blend for our upcoming special edition release of Recluse. It is called the Recluse Draconian. It will be made in three vitolas called Sidewinders. Sidewinders are another new shape that we have created. As we did with our Kanu’ shape, the Sidewinder shape has never been done before in the cigar industry. It will remain undisclosed until its release at this years IPCPR July 13th-17th. 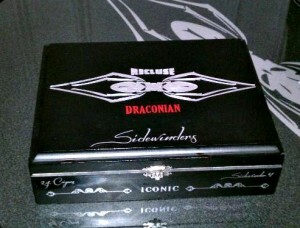 A few select retailers will get an advance release of the Recluse Draconian blend in three box pressed sizes. Recluse Draconian will be rolled in true Entubar fashion as is every cigar that is rolled in the Tabacalera Leyendas Cubanas factory. The Recluse Draconian blend is truly exotic. This blend was created in keeping with our philosophy of creating flavorful, well balanced blends that are smooth with many transitions. We are proud that we have been able to bring quality and innovation together. This is only the beginning. Tabacalera Leyendas Cubanas, which means Cuban Tobacco Legends, is run by J.R. Dominguez; he comes from generations of cigar manufacturers and he wants to have the greatest factory in the Dominican Republic. The first blend released from this factory is the Recluse. Every leaf in the Recluse, the wrapper, the filler and the binder is fermented for Two years. Additional steps taken that separates the Tabacalera Leyendas Cubanas from others include 100% Entubao rolling. Every cigar that’s rolled in the TLC factory is rolled in the cuban style of ‘entubao’. Entubao means tubing. What we do is instead of bunching and pressing the filler, which can affect the draw, we take each filler leaf and roll it up into an individual tube and then we pull those three tubes together which creates three air channels. What you get with the three air channels is an effortless draw. By doing it this way you can do a better box press on the cigar. When you’re compressing the airspace on a cigar, you’re basically reducing the amount of combustion that you have because the airspace is reduced. So what you get with entubao is an effortless draw as well as a cooler, slower and straighter burn. The cigar refuses to burn hot. We have invented new shapes ; we’re blazing a new trail. The OTG on the Recluse stands for Off The Grid, because that’s the way we do our whole business model. The new shape is called Kanu’ It’s really ‘a Picasso’….it’s the perfect ‘storm’ for cigars.